Pop up canopies offer quick and convenient protection from the elements. 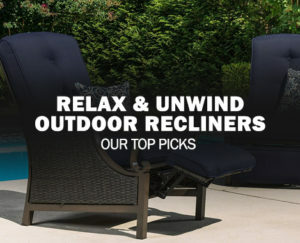 Whether you’re setting up a backyard BBQ or in need of shade for that new camping hammock you bought, they offer a great way to get out of the sun with next to no assembly time. In this article we’ll go over the best of the best in our search for the perfect pop up canopy. We’ll cover the various brands, features and statistics so you can get the perfect canopy for your next event. We’ve put together the table below which details our top picks for quick reference. There are some pop up canopies that are simply superior to others in nearly all respects. The CORE 10’ x 10’ Instant Shelter Pop-Up Canopy Tent is quite simply the leader of the pack. With a unique extended fabric design that keeps the canopy from shifting on the frame and helps improve overall stability, plus a wonderfully efficient top mounted vent this pop up canopy is the creme de la creme. The CORE comes standard with fully taped seams for maximum water resistance and reinforced tie out points for those especially windy days. Not to mention it is able to be set up by two people in under three minutes with a bit of practice due to the pinch free button leg height adjusters and easy to use Velcro strapping system. To make things even better it comes with a high quality roller bag for easy transport of the canopy. The bag features reinforced zippers, compression straps and durable seams to last for year after year of use. While this may be the best pop up canopy we feel the included stakes could have been a bit higher quality, we’d recommend you get an aftermarket brand such as the SE Galvanized Tent Peg Stakes that have a bit more length and durability to match the quality of the canopy. The superior 1” x 1” steel legs are great at stabilizing the canopy and their size is perfect for a set of canopy weight bags to keep the pop-up canopy grounded in even heavy winds. 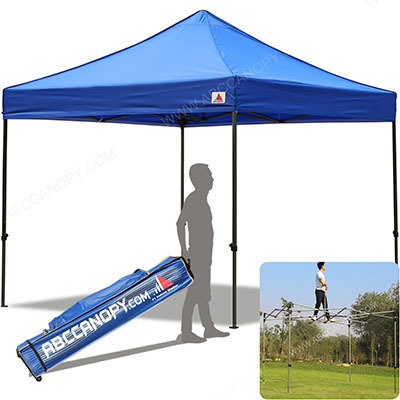 Overall this is our top choice for the best pop up canopy based on it’s features, durability and incredibly unique design that blow most of it’s competitors out of the water. If we had to pick one to buy, it’d be this one. Read more reviews. As a high quality, easily setup and extremely durable pop up canopy, the Eurmax Basic 10×10 is the perfect choice for your next outing. Weighing in at 60lbs with a robust steel frame, straight leg design and 100 sq ft of shade, this pop up canopy is equally at home on the football field as it is on the beach. We were impressed with the full truss support structure and how easy it was to attach the canopy using the built in Velcro straps. Once the pop up canopy is ready to be raised, the four telescopic legs allow for three different height settings, 10.5’, 10.8’ and 11.1’ measured from the peak of the structure. The easy no pinch adjustment tabs make extending the legs a breeze. 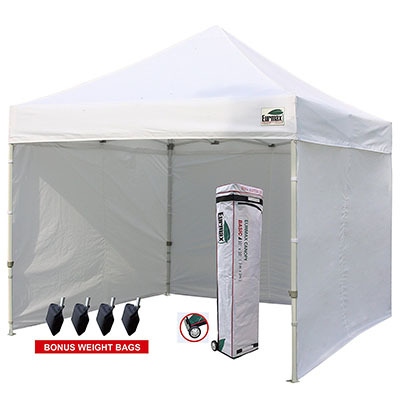 In addition to the built in features the Eurmax basic 10 x 10 pop up canopy comes with guide ropes, stakes, spare hardware and a convenient carry bag in case you need them. The carry bag is actually an extremely well built roller bag that packs down the entire pop-up canopy to a 63” x 9.1” x 9.1” package for easy transport. If you’re someone who likes to add a few walls or panels, you’ll be pleased to hear the inside lip of the pop up canopy has Velcro attachment points for aftermarket privacy panels or window panels. In our opinion this is the one of the best pop up canopies on the market. It has the right combination of features, solid design and versatility to beat out the other competitors we’ve reviewed. If you’re planning to use this in windy conditions be sure to pick up a set of canopy weight bags for added security. 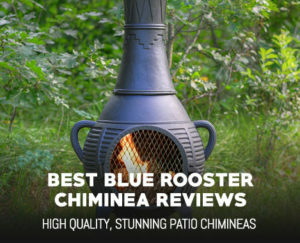 Read more reviews. If you’re tired of having to replace cheap pop up canopies time and time again it’s probably time to upgrade to the Abccanopy Kingkong. As the name suggests this is an extremely durable 10 x 10 pop up canopy that is built to last. The Kingkong comes standard with an exceptionally strong truss designed due to the oversize support members and high quality steel construction. It also features safe push button leg length adjustment sliders for easy setup. On top of the robust frame sits the 100% waterproof canopy top with heat sealed seams for maximum protection. You won’t have to worry about your pop up canopy ripping in even the most brutal wind gusts. What makes this option even better is the 30+ colors it comes in, allowing you to customize the canopy top to match your style, something no other pop up canopy offers. Portability wise this option excels as well with the included carry bag and the fact that it only weighs 48lbs. making it an an excellent lightweight pop up canopy. While we would have like to have seen a roller bag included, one can be purchased separately which will make your life much easier. We also like that this pop up canopy can be stored with the cover on for fast setup and take down. We were disappointed to see there were no sidewall attachment points or included ground anchors with this unit, something standard on most canopies. Another contender for the best pop up canopy that falls just short of the mark is the Snail 10 x 10 Quick Shade Shelter. Made from 420D waterproof Oxford fabric that is both UV and flame resistant, this canopy is built to last. With interior Velcro attachments it is easy to add additional panels to fully customize your canopy. Similar to the Eurmax Basic it has a 1.18” powder coated steel frame that is extremely resistant to rust as well as a solid truss design for maximum stability and support. The frame size is perfect to use with solid canopy weights for extra stability. With convenient safety push adjustment buttons it’s very easy to adjust the shelters telescopic legs to your desired height in a snap. 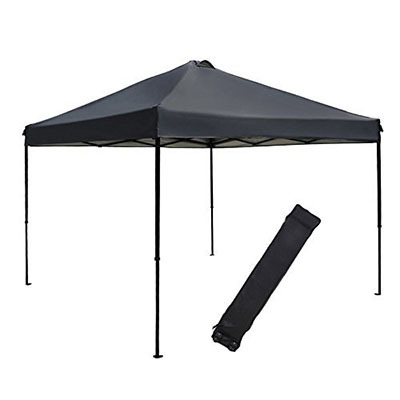 Portability wise this pop up canopy comes in at 63 pounds and packs down to an easy to manage 63” x 9” x 9”, even better it fits in the included carry bag. While the bag itself does a great job of fitting the canopy and has a strong zipper and comfortable leather handle, we would have like to have seen a wheeled design for easy transportation. Also included with the 10 x 10 canopy are guide lines and ground stakes to help secure the canopy to the ground. We always recommend you use these if possible, even if you don’t expect any wind. 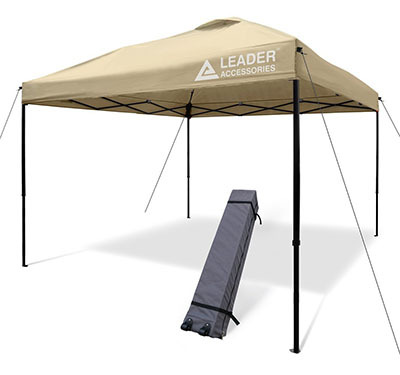 As one of the most compact 10’ x 10’ pop up canopies on the market, the Leader Accessories offering is perfect for those on the go and who need maximum portability. Weighing in at only 42.1 lbs, shipping with an included roller bag and having packed dimensions of 49” x 8” x 9” makes it easily the most portable option on our list. Even so, it still retains many great features of the less mobile options such as 3 stage adjustable legs, steel powder coated frame for enhance stability and rust resistance and a high quality UPF 50+ UV protection canopy for the ultimate in sun protection. 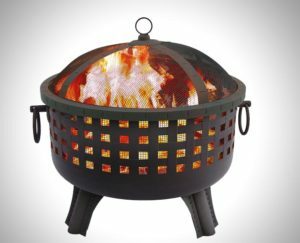 Not to mention it has a high arched top to prevent water collection and includes four tie down lines and eight steel stakes for added wind resistance. What really made this pop up canopy unique was the easy to attach wall panels. While they don’t come standard with the unit you can pick them up at a fairly low cost and they make a world of difference. We tended to like the single wall setup the best to block the majority of the wind and add a bit of privacy to our shady retreat. The walls attach with Velcro and fabric loops and are easily removed for storage. Another great extra you might want to consider getting is the Instant Canopy Roof Storage Shelf. This gives you a ton of extra storage space under your canopy and is specifically tailored to the Leader Accessories canopy for maximum usability. Last up on our list is the durable, yet affordable Abba Patio Instant Pop Up Folding Canopy. 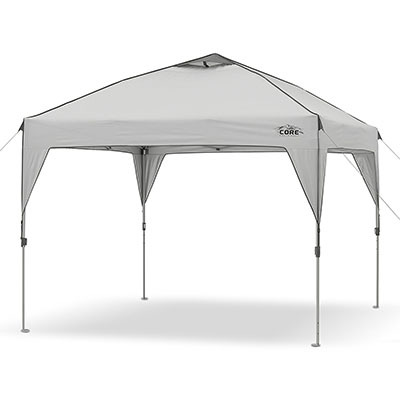 As a budget pop up canopy the Abba Patio offering is perfect for those who want some quick protection from the sun but aren’t quite willing to pay the full price for a premium product. This 10’ x 10’ canopy is made from ultra lightweight 600D Oxford fabric which is both UV protected and flame resistant. The top also has a series of roof vents to assist in keeping the canopy grounded in high winds and reduces trapped heat. With semi-adjustable legs and an 8 minute assembly time it is fairly quick to put together with two people and makes for a perfectly serviceable shelter. If you’re looking for the best pop up canopy on the market the CORE 10′ x 10′ Instant Shelter Pop-Up Canopy Tent is the one to get. 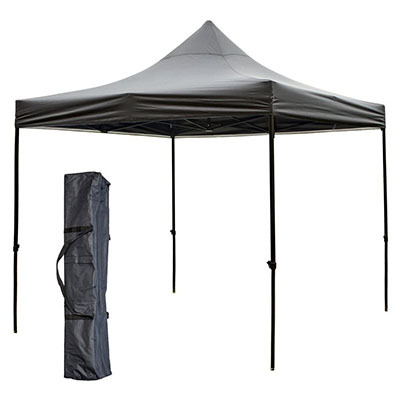 It has the features you want, and the durability you need for a long lasting canopy. With a robust canopy top, resilient steel legs and an incredibly strong truss structure it’s sure to be everything you hoped and more. Some of the other options may have been cheaper or more colorful but none can take the top spot away from the CORE Instant Shelter. You’ll still want to pick up a set of canopy weights and possibly some extended stakes to ensure you have the most stable canopy on the beach, parking lot or in your own backyard.